Reminiscing on the finals, Lee had much to thank Chong for, his support and advice to beat the odds as Lee’s body was still weak after his recovery from dengue. “My face was still red and hot at the final,” described Lee. The victorious team took home RM2000 cash prize. Chong was also awarded the Monash University Malaysia Partial Scholarship, a 50 percent tuition fee waiver. Winning the competition provided the AUSMAT students a clearer perspective of their goals to work in finance or business and more confidence to pursue them. Lee, who perceives AUSMAT as a fast track programme to an Australian degree, is aiming for the Bachelor of Business and Commerce at Monash University Malaysia with the 2+1 programme of transferring his final year to Monash Australia; whilst Chong, who was influenced by all his 5 siblings to do AUSMAT, is keeping his options open to any local or international universities for a degree in Finance. 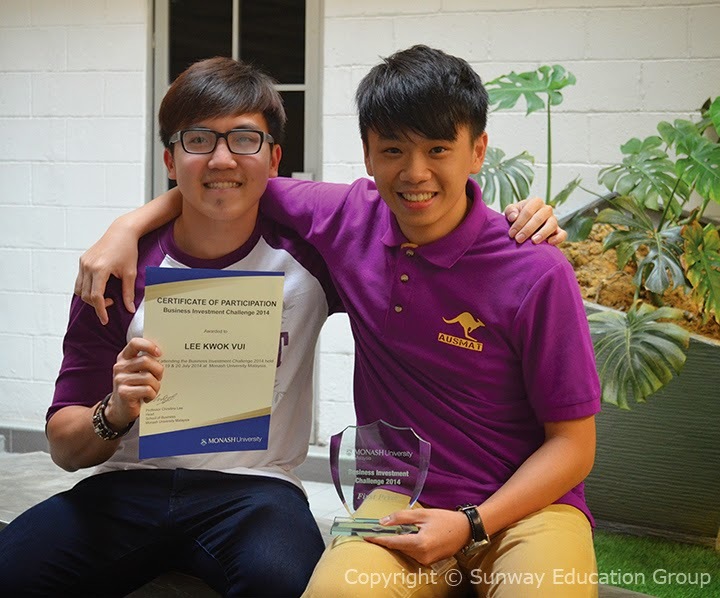 Both Lee and Chong are full of praise for the AUSMAT at Sunway College. The 50 percent school-based and 50 percent examination based assessments offer them the platform and great flexibility to explore their interest and talents. “AUSMAT does not focus only on academic learning; it also helps develop essential soft skills needed for future employment. For example, the I-Care Day, an AUSMAT event to raise funds for charity, allows us to learn business management and trading in the real world,” said Lee.